If you think- as you have learnt - that bacteria are simpler than eukaryotic organisms-you are wrong. In the last decades it turned out that these tiny entities are much more sophisticated as it was imagined ever. They possess the homologues of the most important eukaryotic proteins and these homologues can present link between the ancestral and the phylogenetically higher organisms. In our department you can investigate recombinant proteins which play essential role in the construction of the "bacterial cytoskeleton". To do that you are going to learn how to separate your target protein and you get opportunity to investigate it using different biochemical and spectroscopic methods, such as chromatography, photometry, fluorimetry, and high resolution microscopy. Images: (left) Structure of the actin homologue protein MreB from Thermotoga maritima (PDB ID: 1JCG). (right) Filament system in Caulobacter crescentus. Some widely applied intravenous contrast agents penetrate in the cells and modify the structure of the actin cytoskeleton. The molecular mechanism and further effects of this process is unknown. Our research is focused on these important molecular issues and the possible pathological effects using wide variety of spectroscopic devices and microscopes. During Student Researchers' Society work the undergraduate students do not only have the opportunity to perform the experimental work belongs to their research topic but they can have a look on all ongoing research at the Department of Biophysics and can acquire other laboratory technics and the application of biochemical, microscopic and different spectroscopy methods. The mechanical stability of eukaryote cells is provided by an internal scaffold, the cytoskeleton, whose one main component is the actin filament system. Also these structures are responsible for the majority of cell movements. The actin system is operated by hundreds of regulatory proteins that not only define the properties of the filaments but influence each other’s activities. The elongated tropomyosins bind the filaments longitudinally in a lateral way. They come in several isoforms even within the same cell type, but the significance of this is poorly understood. In the gelsolin family proteins share a similar molecular structure but differ in function. Gelsolin is able to sever, nucleate (promote the formation) or cap (bind to one end) the filaments. It is also known that tropomyosin and gelsolin can bind not only actin but each other, as well. 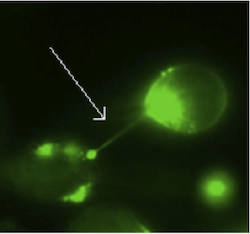 We aim to investigate the interactions of these two types of proteins (and, later on, some other members of the gelsolin family) and how they can mutually influence their regulatory effects on the actin filament. So we try to build a molecular model that can help us understand the functioning of this complex system. During our work we apply both molecular biology tools and fluorescence spectroscopy measurements or microscopy imaging. Fluorescent amino acids that do not naturally occur can be a subject of site-specific incorporation into proteins. This way individual protein species can be labelled in live cells and they can then be investigated by spectroscopy or microscopy methods. The essential part of the technique is to replace the position of interest in the gene by a stop codon and to add such specific tRNAs, carrying the fluorescent non-conventional amino acid, that can recognise this ectopic stop codon. In that manner the labelled amino acid is incorporated only to the desired sites. We aim to generate actin mutants containing fluorescent amino acids at sites that have been inappropriate to be labelled yet. This would make it possible to measure the intramolecular movements in the actin more precisely and to characterise them under different circumstances of investigation. On the other side, the labelled molecules could be good candidates to follow the changes of the actin morphology in live cell experiments. In our studies we plan to apply, beside the methods mentioned above, molecular biology and eukaryote protein expression techniques, as well. In the Department of Biophysics at University of Pécs our research group studies mainly the structure, molecular dynamics and interactions of cytoskeletal proteins with actin in the center of interest. Our research includes membrane nanotubes, which is a relatively new and highly interesting way of direct cellular communication. Membrane nanotubes are long, temporary membrane protrusions, providing more than physical connections between cells. Membrane nanotubes are described as direct communication pathways between certain cells (T-lymphocyte, neuran cells, kidney cells, myeloid cells, some cancer cells) transporting different matters or chemical signals. In the last few years nanotubes have quickly gained interest demonstrating a capability to spread disease among cells avoiding activation of immune system. Viruses, prions, different cell organelles, membranesurface proteins, lipids have been identified to migrate between cells using membrane nanotubes. Our aim to reveal molecular processes and interactions in the formation and function of membrane nanotubes. Figure: Mouse B-lymphocyte (A20) cells (fixated), labeled by Alexa 488 phalloidin, (63x magnification, SIM: structured illumination microscopy image). Arrow indicates a membrane nanotube. This Student Researchers’ Topic is a good possibility for students to participate a collaborating project between clinics and basic science researcher lab. Our clinical partner are Prof. Dr. Miklós Koppán, full professor, clinical director and Dr. Szilárd Papp senior clinical lecturer from the Department of Obstetrics and Gynaecology. We are studying expressed and purified actin and p53 apoptotic factor binding proteins effect on shape, division and movement of epidermal cells from cervical cytology samples. In HPV less, infected and treated patients. Mainly, microscopy, cell manipulation and in vitro methods are avaiable to study the malignus transformation of cancer cells on the level of cytoskeletal system. Our research group studies membrane nanotubes, which is a relatively newly discovered, highly interesting way of direct cellular communication. Membrane nanotubes are long, temporary membrane protrusions, providing more than physical connections between cells. Membrane nanotubes are described as direct communication pathways between certain cells (T-lymphocyte, neural cells, kidney cells, myeloid cells, some cancer cells) transporting different matters or chemical signals. As a result of significant researches, viruses, prions, different cell organelles, membrane surface proteins, lipids have been identified to migrate between cells using membrane nanotubes. Our aim to reveal molecular processes and interactions in the formation and function of membrane nanotubes by the application of superresolution microscopy. Superresolution microscope techniques have been applied only in the last few years in different research fields. Denomination of these instruments originates from their exceptionally good resolution cabability. The Zeiss Elyra-type superresolution microscope found in the Szentágothai Research Centre at University of Pécs has 100 nm resolution, giving twice better resolution than traditional microscopes. A great advantage of this microscope and operation method (SIM, structured illumination) is not only the excellent resolution, but in contrast with other superresolution techniques it does not require special fluorophores, therefore sample preparation is easy. 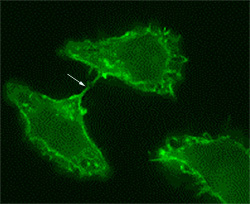 Figure: Murine B-lymphocyte (A20) cells (living), labeled by DiO lipophilic membrane tracker, (63x magnification, SIM: structured illumination microscopy image). Arrow indicates a membrane nanotube. 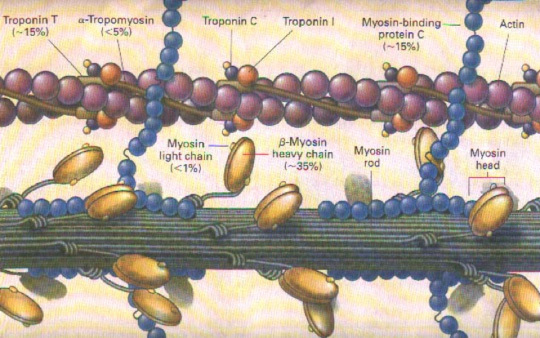 Myosins are motor proteins responsible for cell motility and intracellular transport by converting the chemical energy of ATP into mechanical work. A recently discovered motor protein family is myosin 16, which can be found mostly in developing neurons, but little is known about its proper function. Our research aim is to understand the basic features of this protein which has a unique domain structure. To achive this, we produce recombinant protein fragments in bacterial and baculovirus expression system. The enzymatic properties of the proteins are examined with transient kinetic, spectroscopic and microscopic methods. We are searching for binding partners of myosin 16 in neuronal tissue (newborn rat brain), the interactions are characterised with surface plasmon resonance. The localization or migration of myosin 16 in live cells are visualized with fluorescence microscopy after microinjection. You are welcome to join this diverse project at several points to find answers for exciting scientific problems, meanwhile getting familiar with the latest biomedical techniques.